Pleasure Is A Piece Of Cake. 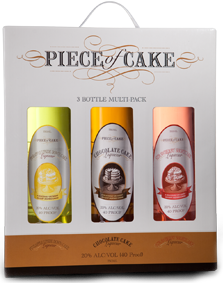 Piece Of Cake is a line of irresistibly smooth, delightfully decadent dessert-inspired liqueurs certain to satisfy the most refined tastes—and to leave you craving more. Whether enjoyed alone over ice or in any of a countless variety of exquisite recipes, the rich, delicious flavor of your Piece Of Cake is sure to satisfy. Every time. Who can resist a classic? Our Chocolate Cake has all of the seductive scent and succulent sweetness of the original. Subtle hazelnut tones overlay a rich, complex chocolate flavor derived from the finest tropical cocoas, creating a smooth, elegant taste sensation that keeps you coming back for seconds. Rich, refreshing, and satisfyingly sweet, our Strawberry Shortcake packs in all of the juicy flavor its name promises. This delightfully lively confection adds a splash of sunshine to any occasion or any season. Serve it up solo, blend it into a delicious cooler, stir it into a daiquiri—Strawberry Shortcake tastes great any way, anywhere, anytime. Our Pineapple Upside Down Cake is like grandma’s favorite recipe—only better. The refreshing, clean fruity flavor, subtle sweetness, and tantalizing aroma make it the perfect partner for any number of mixers. Make it the centerpiece of an exotic, amazing martini. Or, just sip it solo, chilled or over ice. Either way, it’s pure enjoyment. What could be better than any of our delicious Piece of Cake flavors? Three of them. Introducing the Piece Of Cake Multi-Pack. 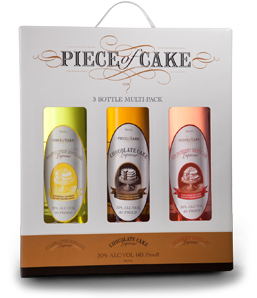 Three delectable slices of Piece of Cake goodness – Pineapple Upside Down Cake, Strawberry Short Cake, and our original Chocolate Cake – wrapped up together in an attractive gift box, and available for one low price. There are 40+ excellent recipes to choose from. "Like" us on Facebook and let us know how you like them! Cheers! !